This is season is quickly turning into a nightmare for Notre Dame, ranked in the top 10 to start the season, but into week 7, owners of five losses in seven games. 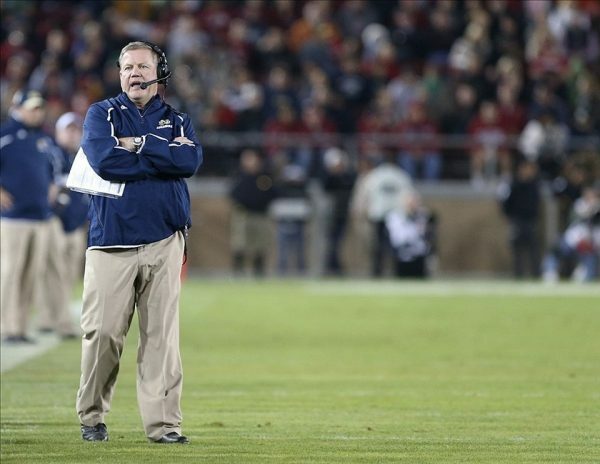 A defensive coordinator has been fired, quarterbacks have been benched and brought back, but one man is to blame (mostly) for this terrible season: Head coach Brian Kelly, who can no longer hide behind what he usually refers to as mistakes of others. SB Nation had a great, funny but sad (if you’re Notre Dame fan) on Brian Kelly, and his long history of blaming others for his own mistakes. He’s not the only high-profile head coach who does it, but guys like Nick Saban tend to soften the blow before doing so, and get away with blaming teenagers for making multi-million dollar mistakes. Kelly’s behavior with his quarterbacks in the loss to Stanford was the perfect example of who he is when it comes to treating his players and throwing them under the bus. Kelly has done such a terrible job at managing his two quarterbacks, Deshone Kizer and Malik Zaire, that he may have ruined them both beyond repair. That’s something that keeps coming up in his tenure as the head coach at Notre Dame: Very good recruiting, but failure to develop players at certain positions, especially on offense. Last season it looked like the Fighting Irish were in a terrific position quarterback-wise, but it feels like the exact opposite in 2016. In any case, Kizer was benched during the second half after throwing two interceptions, one of them returned for a score, as Stanford came back from 10-points down to win 17-10. But on the final drive, after Zaire failed to complete a pass, Kelly threw Kizer back in the game to try and save it on the final drive. Surprise, surprise: It didn’t work. Notre Dame fell to 2-5, losing four of their last five, and scoring just 13 points in their last two games. The defense, with a new defensive coordinator, has been fine in the last two games, although both North Carolina State and a Christian McCaffrey-less Stanford aren’t exactly offensive juggernauts. But the offense is on Kelly. And it’s come off the track recently. Maybe it’s players losing faith in a coach that keeps blaming them. Maybe it’s not identifying which of his quarterbacks deserves the 100% support, and not learning from past dual-quarterback mistakes on other teams. But one thing seems to be clearer: Kelly should be on the hot seat. One losing season (it’s hard to see this year not ending with a losing record) after going 55-23 in his previous six seasons, including never worse than 8 wins and two 10+ win seasons, isn’t going to get Kelly fired. But whatever credit remains between him and the Notre Dame front office is quickly running out, not just because of the results, but because Kelly is proving to be a head coach that fails to account for his own mistakes, latching on to any excuse that shrugs away responsibility from him.